Many reviewers say that the Bounce technology in the midsole effectively protects their legs and knees from stress and fatigue. A couple of testers made the Adidas Pro Bounce 2018 Low a part of their rotation. Once broken in, the rubber outsole seems to stop collecting so much dust. Several users are happy with the design of these Adidas basketball shoes. They claim that they are aesthetically appealing both on and off court. Many buyers are pleased that the Pro Bounce Low is light. The outriggers on both sides of the shoe deliver stability upon landing, claim most testers. A good number of reviewers notice that the Adidas Pro Bounce 2018 Low is versatile. They say that heavy and light players will enjoy playing in these low-top basketball shoes. According to a handful of testers, the tongue of the Adidas Pro Bounce Low is not really secure and moves to the side during play. Some users claim that these Adidas shoes do not have enough support. The Adidas Pro Bounce 2018 Low is a great and affordable performance shoe based on consumer feedback and sneaker reviews. This low-top basketball shoe surely has it all: a good price, highly effective Bounce in its midsole, awesome traction, and a breathable upper. They are also aesthetically appealing. I would definitely recommend you all pick up a pair of the Pro Bounce. You guys won't be disappoint. This is a very good all around shoe. I love playing in these. And these will probably be in my rotation. Would I recommend you to buy the Pro Bounce? The answer is yes. It is a very nice shoe to have for balling especially if you're on a budget. Released in August 2018, the Adidas Pro Bounce 2018 Low retails at $110. It features full-length Bounce for a smooth and comfortable ride. The light textile mesh upper is reinforced with knit for a durable fit. The ankle collar is equipped with the Geofit technology for comfort. The enhanced traction pattern has a promising performance once broken in. These low-top basketball shoes suit any player in any position. Some wearers would love to wear signature shoes with the same price range as the Pro Bounce 2018 Low. Adidas offers Damian Lillard’s fifth signature sneaker in a mid-top form with the same Bounce cushioning. Cushion. The responsiveness of the Adidas Pro Bounce 2018 Low comes from the full-length Bounce in its midsole. It is a lightweight foam known to absorb impact. It quickly bounces back to its original shape, providing explosive energy returns in the process. For rigidity, the midfoot comes with a TPU shank. Traction. The Adidas Pro Bounce 2018 Low features an enhanced traction pattern in concentric circles. This pattern delivers reliable floor control especially during the execution of multidirectional footwork. For balance and court grip, there are four suction-like holes in the forefoot area. 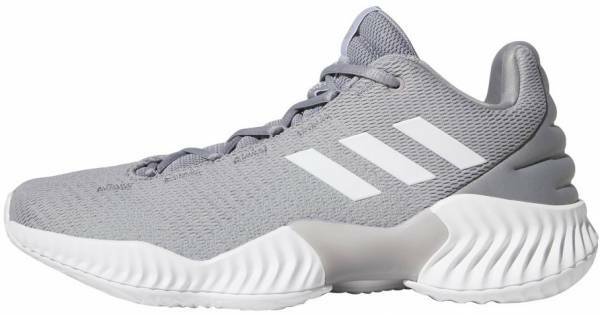 Depending on the colorway, these Adidas basketball shoes come in either a solid or translucent rubber outsole. Length and Width. The Adidas Pro Bounce 2018 Low is reported to be true to size. So far, there are no issues with the fit. If in doubt, new buyers are advised to fit the shoe before buying. Lockdown. To keep the foot in place, the Adidas Pro Bounce Low uses the traditional lacing system. It also has outriggers for added support. These added features become especially useful when the player is in aggressive motion. The upper of the Adidas Pro Bounce Low features two technologies–Forgefiber and Geofit. The Geofit is the small pillow-like cushioning units that are embedded in the inner walls of the shoe for ankle comfort. The Forgefiber technology is composed of TPU-coated fibers that are heat-pressed. They are stitched on the sides of the knit upper for support and durability. The Adidas Pro Bounce 2018 Low reportedly looks like a team shoe. For those who do not play hoops, these low-top basketball shoes can be used as part of their casual or office outfits. They look great with either long or short pants and a simple shirt. Plain or black leather jackets are great additions, too.